Regarding how Vietnam’s seaport development strategy contributes to sustainable development of the marine economy, Vietnam Business Forum has an interview with Mr. Ho Kim Lan, Secretary General of the Vietnam Seaports Association. Minh Ngoc reports. Most recently, on October 22, 2018, Party General Secretary and President Nguyen Phu Trong signed Resolution 36-NQ/TW on the Vietnam Sustainable Marine Economic Development Strategy to 2030, with a vision to 2045, which stresses the need for building complete logistics infrastructure, connecting seaports with the rest of the country and with the world. What do you think about Vietnam's seaport operators today? Vietnamese seaport companies belong to different economic sectors, ranging from State-owned, joint stock and private companies to joint venture ports with world-leading seaport operators and shipping firms which have invested a lot of money in seaports, particularly deep-water container terminals of international standards. 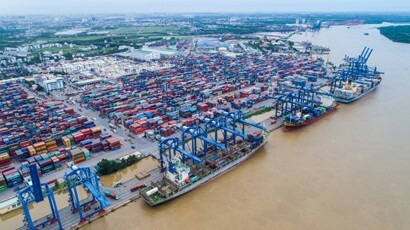 In general, in the past many years, amidst many huge shortcomings, particularly transport connectivity and service integration, most Vietnamese seaport companies have developed rapidly to provide foreign trade and domestic distribution services. In my opinion, seaport operators are generally very quick at business and development opportunities. When authorities ensure their commitment to connecting traffic, support services and necessary facilities for seaport operation and forming a transparent and healthy competitive environment, seaport and logistics companies will have their best solutions. The Government should have a mechanism to manage, encourage and regulate how the market attracts development investment to make every service sector and the entire system develop synchronously, effectively, rapidly and sustainably. This requirement belongs to the superstructure that an enabling government should take advantage of all resources, including international consultants, to proactively move many steps ahead as mentioned above, not wait for solution to every problem or conflict of interest as today. What do new-generation FTAs ​​mean to the seaport industry? How do seaport businesses address their weaknesses for their global integration? Compared to other economic sectors, Vietnam's seaport industry has been taking the lead in international economic integration and created favorable conditions to meet local and national economic development needs. However, businesses need to focus on strengthening coordination among industries, localities, competent authorities and other business associations to implement joint plans, programs and tasks to innovate and develop seaports, increase productivity, service quality and performance to catch up with development trends and meet market demands (containerization and use of large vessels), restrict internal competition to attract more international cargo ships. It is necessary to standardize and apply information and communication technology (ICT) to effective and secure port management and operation; interconnect customs offices, banks, shippers and the National Single Window (NSW) portal. At the same time, it is important to ensure safety, hygiene and environment, respond to climate change, better exercise corporate social responsibility to the community. Logistics costs are very high in Vietnam, accounting for nearly 21% of the country's GDP. Is there any solution to quickly reduce these costs? In the short term, there is a need for solutions to reduce unreasonable costs and time loss through transport segments, import and export procedures and port-based delivery and receipt of goods. Next, it is essential to have organizations responsible for synchronous port infrastructure development for each port group as planned, assign more responsibility to localities according to the Maritime Law 2015. The major existing issue is the interconnection of seaports with the rear and logistics service systems. Would you tell us what measures the Vietnam Seaports Association adopts to improve the performance of the Vietnamese port system? Vietnamese seaports have satisfied national and local economic development needs in the past time and have evolved to improve performance based on the government-based seaport privatization policy. Except for a few ports invested to stay on par with some countries in container cargo throughput and services delivered to large vessels, most ports are still encountering hardships in market, traffic connection and operation and their own operating capacity. At present, there are still many shortcomings that need to be addressed to facilitate Vietnamese seaports to develop competitively with the region and the world. In my opinion, in order to further improve the performance of the Vietnamese port system, the mode of transport connection needs to be further improved. Major national ports need to be connected to the North - South Railway and to international and regional corridors. In particular, competent bodies should study, develop and pilot management mechanisms for seaport infrastructure and maritime channel development according to the port operator model specified in the Maritime Law 2015 for each key economic zone, accompanied by public-private partnership (PPP) mechanism to attract all resources for further port development. For its part, the association asked competent agencies to remove obstacles against enterprises to ensure the sustainable development of the seaport industry.